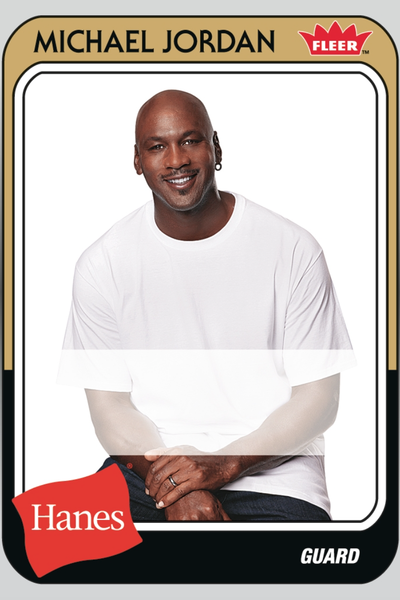 Hanes is celebrating 30 years with Michael Jordan as a spokesperson with trading cards featuring the basketball legend. Consumers who buy specially marked bonus packs of men’s underwear get a five-card pack of 30th Anniversary Michael Jordan trading cards. Ten consumers will find a rare Michael Jordan autograph card with his signature in their packs. A total of 170 different Fleer trading cards have been produced by The Upper Deck Company, each with a picture of Jordan from one of his Hanes advertisements on the front and vital statistics and fun facts on the back. Cards are inserted randomly in five-card packs. More than 800,000 specially marked bonus packs of Hanes men's underwear, including Comfort Flex Fit boxer briefs, will contain the trading cards. Television spots supporting the promotion will be aired during March Madness on CBS, TBS, TNT and TruTV; on ESPN, CBS Sports and other cable sports networks; and on FX, MTV/MTV2, ION and a variety of other cable stations. The partnership between Hanes and Michael Jordan began in 1989 with the star player telling consumers that, "Nothing else feels so right." Jordan scored the 10,000th point in his basketball career and hit "The Shot," one of the most dramatic NBA playoff-series winning buzzer beaters in the history of the sport. A limited number of bonus packs with trading cards are available on the Hanes website and across all retail channels -- from dollar to department stores, both in store and online, including Kohl’s, JC Penney, Walmart, Meijer, Kmart and Dollar General. 2 comments about "Hanes Offers Michael Jordan Trading Cards". John Grono from GAP Research, March 25, 2019 at 6:18 p.m.
Tanya, did Michael Jordan graciously accept the trading cards that Hanes offered? Tanya Gazdik from MediaPost replied, March 25, 2019 at 6:33 p.m.
Lol, knowing Michael, I’m sure he’d be gracious. I suppose we could have put -themed in the headline but I think the photo helps explain.